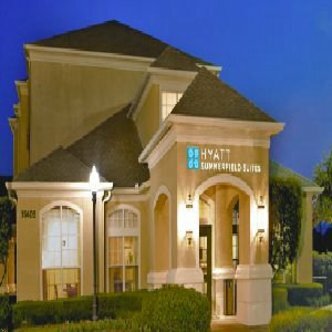 Hyatt Summerfield Suites offers the flexibility and essential services of a typical hotel but with the space, comfort and conveniences of a completely furnished apartment. Spacious architectural design gives the property a residential appearance and appeal.Each suite features separate living, dining room, bedroom, bath and fully equipped kitchen areas, all at prices significantly lower than typical hotel rooms.Complimentary services: Transportation available within a 5 mile radius offered each weekday morning from 7AM to 8AM and each weekday afternoon from 430PM to 530PM. Daily full breakfast buffet includes juice, milk, Starbucks coffee, yogurt, pastries, cereal, toast, bagels and fruit. Evening Social Hour includes beer, wine, soft drinks and appetizers. Outdoor parking. Local calls. Welcome Basket includes Nutrigrain bars, coffee, tea and popcorn. Business Center available 24 hours a day with Internet access.